Written on 02 July 2015 . Events Championships World Vovinam IV will be held in Algeria in late July 2015 marked the coming major landmark in the promotion and development of martial arts of ethnic Vietnamese elite in Algeria say and the whole of Africa and the world in general. We had an interview with Master Vo Danh Hai – General Secretary of the World Vovinam Federation before the event is important and meaningful. Can you tell review of the World Vovinam Federation on the development of Vovinam movement in Africa? He had thoughts of how to separate Vovinam in Algeria – the leading African region? As we all know, Algeria is one of the first cradle of the process of promoting and developing Vovinam movement in the world and especially in Africa in particular. The success of Algeria’s team today, with strong growth, widespread dissemination of Vovinam in this North African country to join hands for a positive contribution of many individuals and organizations, which must include to the enthusiastic masters have worked closely and teach the African students as: Mohamed Djouadj, Djamel Tazibt … Especially, Vovinam Algeria has received attention and support from the Government valuable, Ministry of Sports Sports and Martial Arts Federation and National Olympic Committee Algeria. I’m also really proud and grateful for the special attention of tens of thousands of people of Algeria for Vietnamese martial, along with national media agencies and local continuous support coverage, helping to advertise culture – traditional sport of the people of Vietnam. Prime Minister Nguyen Tan Dung photographed with President Mohamed Djiouadji FAVV. Can you tell us some information on the preparation and organization of the World Championship tournament this year. As a country with the fastest growing movement African region, with the capacity and the best experience through multiple and competing to host the sport event of large-scale, world class fact, Algeria has been a good preparation for the World Vovinam Championship fourth time and have confirmed the role and its position with the greatest commitment to this event is taking place successfully. 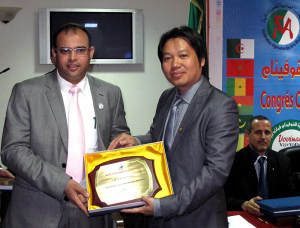 During a working visit to Ho Chi Minh City at the beginning of last May 2015, representatives of the Algerian Organizing Committee said: Martial Arts Federation Algeria has collaborated closely with the Federation of Africa to establish organizational schemes, establishment of local organizations and in cooperation with the ministries, departments and agencies to assign tasks and deploy thoughtful preparatory work in all fields. He Djouadi Mohammed – Chairman of Federation of Africa (center), Mr. Djamel Tazibt – Martial Arts Federation Chairman Algeria (left) had a working session with Vo Danh Hai – General Secretary WVVF (2nd right) Mr. Mai Ba Hung – Deputy Director of the Department of Culture Sports and Tourism Ho Chi Minh City (2nd left) and Master Nguyen Chanh Tu (rightmost) to prepare for the World Vovinam Championships take place at the end of this July. This is an important event was the interest and support of the President of Algeria and Mohammed by Sports Minister chaired the supervisory Tahmi. The organizers have arranged stadium Hercha Hassan takes place prize, along with reservations for 300 delegates, the participating delegations, recruited nearly 100 volunteers serving solutions. 04 On 10 January 2015 was held the press conference to disclose information about the League, with the participation of 15 central mass media agencies and localities. Taking place from July 28 to August 2, 2015, this tournament is an important event was the interest and support of the President of Algeria and Mohammed Tahmi by ministers chaired supervision. So the Secretary General of the feeling what WVVF for the joint development of Vovinam – Vo Dao Vietnam today? Overall, I appreciate all the efforts and the positive contribution of collective masters, Vovinam students, along with the companionship, support of the concerned departments and organizations Sports helped for developing Vovinam worldwide stature as today. That’s pride when Vietnam Vo Dao has really realized the dream “world class themselves”. Over more than 70 years of establishment and development of the discipline, we have obtained a certain number of achievements: Vovinam has become an official sport at the Asian Games in the house – AIG III in 2009, SEA Games 26 and 27 in Indonesia (2011) and Myanmar (2013), and soon, in the Congress of Sports Beach – Beach Games in 2016. But this year, Vovinam can not be present at the 28th SEA Games in Singapore, but the World Championships IV in Algeria attracted nearly 20 countries attended, I can say that development of Vovinam movement has not ended in Here, far from conquering the arena rather than a long-term goal to strive for, but what can be done, by the faith of the Vietnamese people. The development of Vovinam is not only a step of Martial Arts of Vietnam, affirmed its position in the field of sport world class, but it was the success of one’s power “diplomacy culture “. Through a martial tradition of the nation, more than 60 countries across five continents world has known Vietnam with beautiful images and fascinating history. The tournament, from the national level, the continent until the world championship is not just a playground, where friction and discipline of the athlete to achieve the coveted medal, but it was Vovinam occasion for family reunion, linked together, on a large and happier.